Dr. Lavoie completed his undergraduate education at the University of Maine. He received his Doctorate in Chiropractic from Palmer College in Davenport, Iowa. He obtained the postgraduate designation of Certified Chiropractic Sports Practitioner and is currently working towards his Diplomate of the American Chiropractic Board of Sports Physicians. 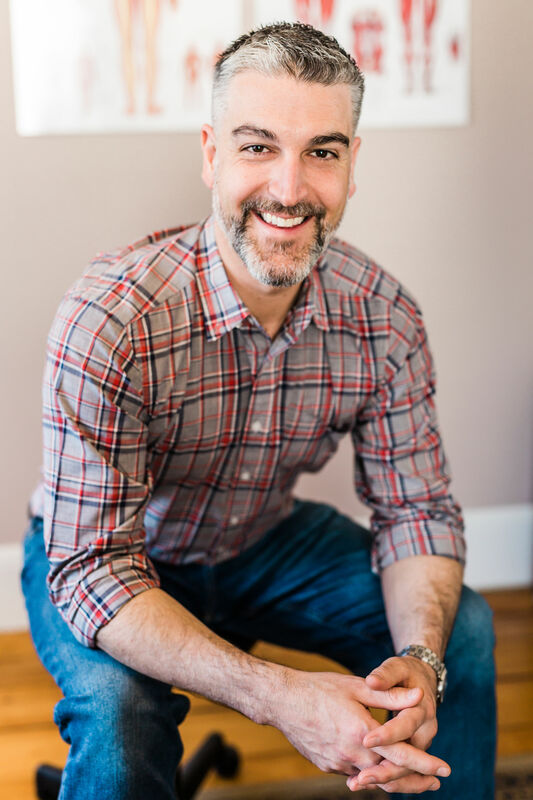 After graduating in 2004, Dr. Lavoie returned to Maine and held two associate positions in Scarborough and Falmouth before opening his own practice in 2006. The clinic outgrew its location two times before finding its current location in the historic Charlotte Millett Home. “My passion is people, I love learning from people and helping them any way I can.” When Dr. Lavoie is not caring for patients you can find him volunteering, cycling, enjoying the outdoors, spending time with his wife Amanda, and their two children, Alexandra and Louie. Dr. Lavoie is an active board member and Chair of the Greater Portland chapter of the New England Mountain Bike Association, as well as, chairperson of Gorham’s Conservation Commission. Kim joined the CCG team in 2017, bringing with her extensive billing and claims experience. You will find her at the front desk and she is happy to address all account and insurance questions. Outside the office, she enjoys walks with her Great Dane and spending time at the beach. Lea grew up in Hopkinton, Massachusetts and graduated from Hopkinton High School. She is currently studying to become a nurse at the University of Southern Maine. You will see her assisting with various tasks around the office including front desk, marketing, and patient relations. When Lea is not working, she loves to spend time with her family and enjoy the outdoors. You may see this kind and gentle soul from time to time at the office. Otis is an expert at keeping your kids entertained while you are getting adjusted. He enjoys people, belly rubs, treats, and chasing squirrels.